With these Dan Brown novels, Ron Howard has just about the sweetest gig in Hollywood: a veritable cash cow franchise not dependant on anything but some controversial Vatican-bashing. “The Da Vinci Code” was a pulpy novel to start, which, to the surprise of everyone, including the author, became the must-read of 2004. Even I, a casual fiction reader at best, read it and was unimpressed. The movie was a middle-of-the-road thriller in every aspect of its production. So how can anyone get jazzed by “Angels and Demons”? Not a sequel, or a prequel really, just another adventure for Robert Langdon, the Harvard symbologist and puzzle-solver-for-hire. In this episode, Langdon is brought in the Vatican to help locate four kidnapped monks who happen to be the leading candidates for the vacated Papal office. The infamous Illuminati, another subversive organization bent on taking down the Catholic Church, have taken credit, and since Langdon knows their historical trajectory, he’s the best man for the job. He and his scientist partner, Vittoria Vetra (a stunning Israeli actress, Ayelet Zurer) scour the archives of the Vatican deciphering codes seeking to discover the location of each monk. Oh yeah, there’s also some stolen anti-matter from a local French science base which threatens to blow up Rome. “Angels and Demons” goes so far off the deep-end, it makes “The Da Vinci Code” look like social realism. The opening sequence establishes a ticking clock device which would have seemed ridiculous in a Pierce Brosnan Bond Picture. Anti-matter? Huh? A lame attempt to incorporate a scientifically plausible theory of creationism – after all, one of the running themes of the series is creating controversy around the steadfast Catholic beliefs. There’s nothing profound in anti-matter, just bubble gum dramatics. The attraction of “The Da Vinci Code” was the connection of religious history, sacred works of art and historical science. To give Dan Brown some credit, the core ideas were intriguing and his historical connections actually seemed plausible. In "Angels & Demon" the puzzles are hastily told to us by Langdon without the time to linger on the historical context of what he’s discovering. 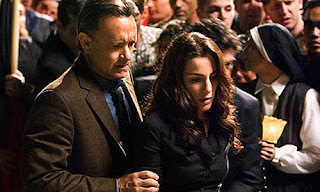 Even the puzzles in “National Treasure” are more interesting. The action is episodic and seems to serve only to break-up the boredom. Langdon’s near death experience in the locked down archive basement is out of disaster-movie 101, adventure without conflict, just a contrived sequence of false jeopardy without any impact of the story. There’s a couple of twists, which are telegraphed too accurately by Howard. As soon as the real baddie shows up on screen, we know what’s going to happen – in fact, I guessed it already from the trailer. The saving grace of the film is the casting of Nikolaj Lie Kaas as the hitman heavy who kills with great proficiency. Kass is a Danish actor, who is largely unknown outside of his own country, but anyone who knows the work of Susanne Bier and Anders Thomas Jensen knows Kaas is a casting coup waiting to happen. Howard knows it and it’s the only inspired aspect of the film. As with "The Da Vinci Code", everyone here ‘phones it in’ – but going by the success of Da Vinci, only the bare minimum is required to make these films successful. This movie is laughably bad. One of Ron Howard's absolute worst. He should have his DGA card revoked.